Do you have experience assisting a senior or someone with a disability with care needs such as meal preparation, bathing, dressing, running errands, or performing household chores? Have you ever worked as a paid caregiver or served as a volunteer for a hospice, nursing home, veteran’s home, meal delivery service, local Department on Aging or church senior program? Have you ever known anyone or assisted anyone with an age-related disease such as Alzheimer’s Disease, Parkinson’s Disease, Macular Degeneration, or Stroke? 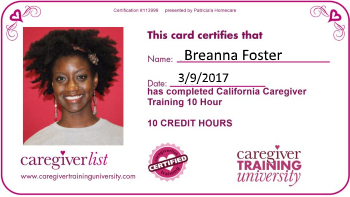 Have you completed a certification program to become a Certified Nursing Aide or Home Health Aide? Are you trained in assisting and interacting with seniors suffering from memory loss, including Alzheimer’s Disease? Are you trained in CPR? Do you know how to safely use a gait belt? Do you know how to safely transfer and position someone from bed to chair to wheelchair to commode and back, including using a draw sheet and slide board, if necessary? Have you successfully passed a multi-state criminal background check for a former employer or have verification of passing one? Have you worked as a professional paid caregiver for 1 year or more?